Stan won the match, and Novak also won the hearts of the crowd, with one of the best, extended standing ovations in the awards ceremony I have ever seen in our sport. Novak is hardly ever the crowd favorite, or gets the fan respect he completely deserves. Well, all that changed when he received his runner-up trophy, and the crowd extended their applause for a long, long time – signaling their deep respect for all he does in our game. I loved it – and I personally congratulation every single one of you on Court Philippe Chatrier for that. Nice touch. Boy, was that impressive, on so many levels. Firstly, you have got to start with the game plan that he and coach, Magnus Norman, put together. There was only one way that this match was going to be his – he had to reach out and take it. I clearly remember watching the first few points when Djokovic played Nadal in the quarters. It was all Novak. It was all offense, because that was the right way to take down the nine-time champion. You could tell from the first minute that Novak was wearing the pants, and that Nadal was going to be on permanent defense. Well, the exact same plot played out in the final, but it was Stan who was directing traffic this time. From the first handful of points, it was clearly obvious that Stan had a plan, and it was to swing as hard as he could first, and check the score later. Well, it worked. It didn’t work immediately, as he developed the plan and got more comfortable with it, but it mattered big time at the end of the match, with the title on the line. I want to go back and review my preview of the match – where I predicted Djokovic would win in 3 or 4 sets. I want to pinpoint how Stan completely derailed that school of thought with spectacular offense. 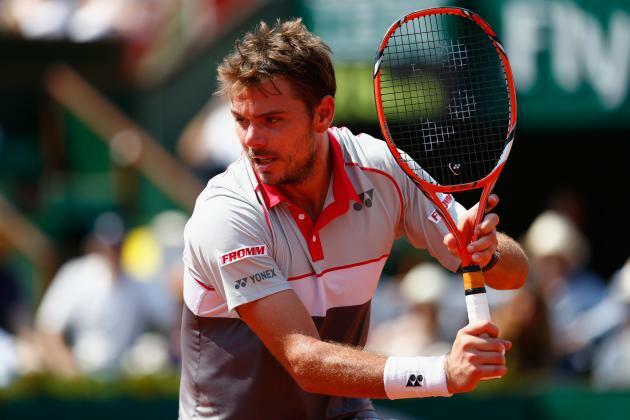 I had a concern with Stan’s double faults coming into the French Open final. Well, he served nine aces and only three double faults to make it a complete non-factor. I also predicted Stan needed to win at least 50% of his second serve points to win the final. Well, he hit that number right on the head, winning 21 of 42 for exactly 50%. The other major upgrade for Wawrinka was that his first serve percentage went from a tournament average of 50% leading into the final, to a ridiculous 67% in the final. Who saw that coming? In the previous 6 matches, Stan’s first serve percentage was sub par. It’s very clear to see that the moment, the momentum, the adrenaline, the history he could reach out and take, all contributed to by far and away his best serving day of the entire tournament. Nothing else came close to the numbers he put up in the final. He was in full attack mode – full beast mode – and he kept nailing it again and again. Fantastic. This is where Stan grabbed the match by the scruff of the neck. He went toe to toe with the best baseline in our sport at the moment, and well, completely dominated him. For Novak to perform so poorly at the baseline was another key element of the final that was so out of left field. You could imagine Novak’s win percentage dropping over one or two percentage points in such an important match, but not 12%. Not Novak. Going down the line against Novak is a perfect counter-move to interrupt his defensive prowess. If he can’t touch it, he can’t defend it. Stan hit five pure backhand down the line winners in the final 22 points of the fourth set to completely wrestle control of the match. When he needed it most, it was right there for him. It was a day when very little went wrong with his backhand. Overall, Stan hit 60 winners to 30 and 26 (almost half) were from the forehand wing. He really loved his little run-around in the middle of the court (running from baseline position B to C) and then taking that behind Novak to his backhand, wrong-footing him. Seven of his 10 forehand winners standing in the Ad court were this way. When standing in the deuce court, he hit 15 winners, including seven straight down the line at 1000 miles an hour. The forehand unforced errors that had been a problem coming into the final (40 more than Novak 108/68) ended up not being a problem at all. Stan had 21 forehand unforced errors in the final, and Novak actually performed worse in this category with 23. No harm done there whatsoever. Stan owned the baseline, and he also owned the net, winning 70% (23/33) points coming forward. The main reason he came forward so much was that his huge groundstrokes were bringing back a lot of short balls from Novak, that allowed him to come to the net. With the match on the line, at 0-40, 3-4 in the fourth set, he finished at the net four out of five points – with the other one being a service winner. 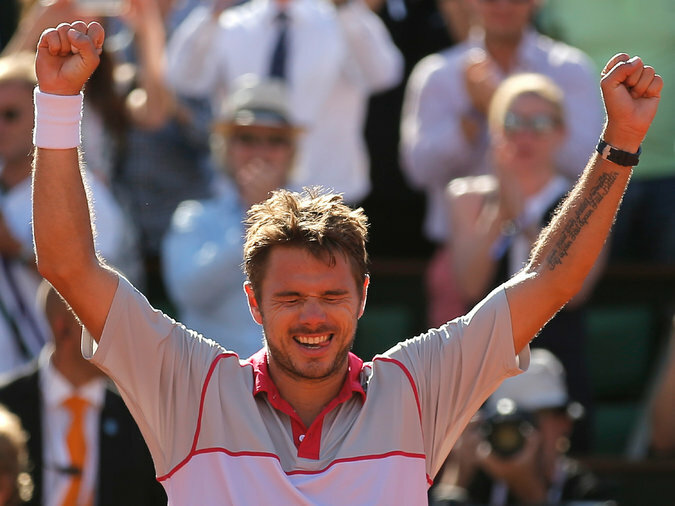 The net was a happy place for Stan in the final. Novak was not nearly as successful coming forward, only winning 58% (14/24). Here are some important quotes to consider from Stan in his French Open final post-match press conference. Stan went for his shots – because he had to. There was no other way for him to beat Novak. He was not going to out grind him, or make one more ball, or serve and volley his way to the title. More than anyone else, Stan has the ability to completely pole-axe groundstrokes, so that is what he had to do if he was going to win. He had to go for it, with smart patterns, down the line patterns, that would take away Novak’s magical defense – take the racket out of his hand. This was one of those matches that right from the first handful of shots, couple of points, you could see it coming. The problems that I wrote about in his run to the final all basically evaporated when Stan dictated pretty much every point against Novak. The bigger you play, the better you get at it. The more confidence you get in the tactic. Stan played one of the best matches he will ever play. He was absolutely amazing. He went and took the French Open final from Novak. That’s how you want to win something like this.